Americans use more water per person than anyone else in the world. 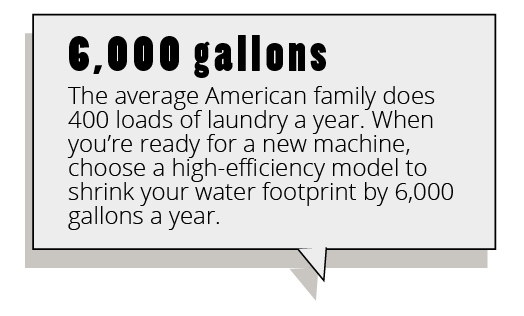 More than 27 billion gallons of water drip through U.S. households every single day via our faucets, showers, toilets, washing machines, sprinklers and hoses. The river systems, lakes and wetlands that provide this water are home to countless species of wildlife – many of which are now threatened or endangered due to the pressure of population growth and reckless water consumption that’s altering ecosystems and sucking habitats dry. 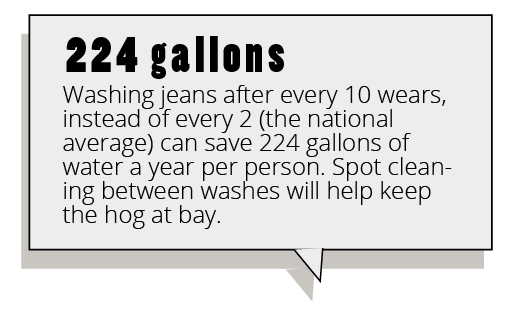 It’s time for us to stop hogging all the water and start saving some for wildlife. 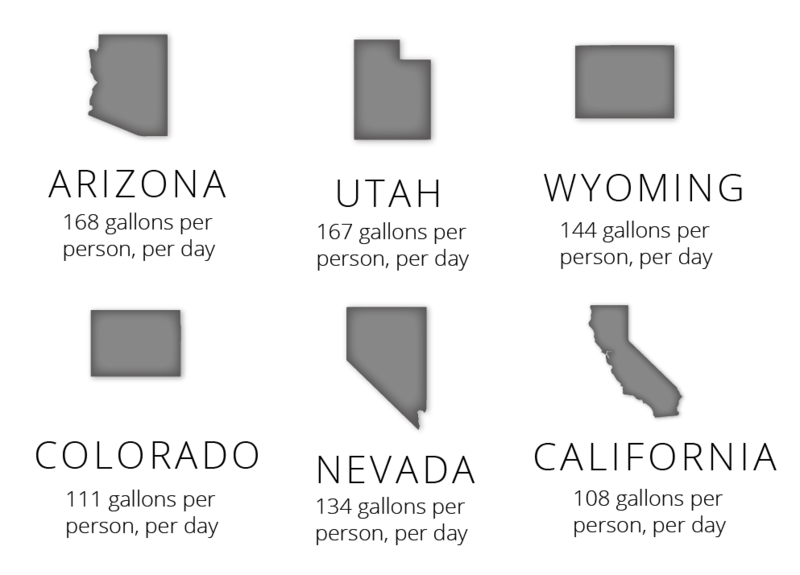 Utah is the second driest state in the country, yet it uses more water per capita than almost anyone else. Nearly two-thirds of water consumption in the state happens outdoors – mostly for watering lawns and, according the Salt Lake County’s Residential Lawn Watering Guide, being done so incorrectly. With so little rain in the region, residents need to shore up on their watering techniques and water less. 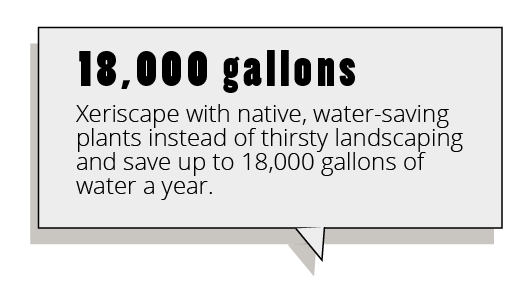 Or, better yet, swap out their lawn for water-friendly xeriscaping. Salt Lake County’s water supply comes from the major and minor stream systems flowing through the Wasatch Mountain canyons. From bald eagles and burrowing owls to least chubs and lyrate mountainsnails, the region is full of rich biodiversity that’s threatened by the changing landscape due, in part, to urbanization, population growth and water overconsumption. The Arizona Department of Water Resources features a quote on its website: “We never know the worth of water till the well is dry.” You might think this hot, dry state knew the value of water, but a whopping 70 percent of individual water use flows to outdoor consumption that doesn’t make sense in a desert climate, like watering lawns, filling swimming pools and washing cars. And the state’s capitol sets a poor example by being one of the biggest per capita water hogs in the country. Some small improvements have been made – Phoenix now uses reclaimed water from the Cave Creek Water Reclamation Plant to irrigate turf – but there’s much more the city and its residents can do to save water, from smarter landscaping to curbing daily consumption. The water in Maricopa County’s sprinklers and pipes comes from the Salt River Project, which includes the Salt and Verde river systems. Many migratory bird species depend on these river systems as critical flyaway habitat. The Verde is home to nesting bald eagles, beaver, river otter, rare species of reptiles and amphibians, and many species of native fish. Maricopa also pulls water from the Colorado River, which has been stressed by outdated competing water rights that serve several western water hog cities including Phoenix, Las Vegas and Los Angeles and pre-date booming population growth in the region. In the midst of a record-breaking drought, Riverside County boasts the locale with the country’s highest per capita water use: Myoma Dunes Mutual Water Company reports that its customers use 379 gallons per person, per day. This county is an area that loves water-sucking landscaping with more than 7,400 public swimming pools, spas and water features, and 11 golf courses within a single five-mile area of the Coachella Valley desert. Riverside County gets its water from the Sacramento-San Joaquin Delta and the Colorado River. The Delta provides habitat for 20 endangered species, including the Delta smelt, California Ridgway’s (formerly Clapper) Rail, Lange’s metalmark butterfly, longfin smelt, Salt Marsh harvest mouse, California red-legged frog and California tiger salamander, and serves as a vital migration path for native salmon. The Colorado River, where reservoirs have dropped to record lows in recent years due to outdated water rights and booming population in some of the thirstiest counties in the country, is also home to several endangered species. In 2014, water in the San Bernardino Basin reached its lowest level in recorded history, breaking a 50-year-old record previously held by the end of a 20-year drought. Like most areas, the attempt to maintain grassy lawns in high temperatures is the top culprit for water waste. The situation has become so dry that along with fellow water hog Riverside County, San Bernardino officials launched a “Your Future is More Important Than Your Lawn” campaign. Between the basin’s full line and current levels, the amount of missing water would be enough to meet the needs of 1,650 average-sized homes for an entire year. The water isn’t there, but all those homes still are, and they continue to draw from groundwater, leaving less and less for local wildlife, such as steelhead trout, Arroyo toads, San Bernardino kangaroo rats and unarmored three spine sticklebacks. Additional water for the county comes from the Colorado River and the Sacramento-San Joaquin Delta, which is home to 20 endangered species. The average American uses 50 to 70 percent of their household water budget on yard care, but for Long Island residents, keeping up with the Joneses means dedicating a whopping 90 percent of daily water usage to maintaining those lush green lawns during the summer. Far from the drought-ridden West, many residents have become careless with automatic sprinkler systems set to spray every day, rain or shine, and which often waste more water than what reaches the grass roots. Nassau County may not be suffering from severe drought, but more water is being removed from its aquifers than is being replenished by rain. That kind of imbalance leads to saltwater intrusion, which can alter ecosystems and contaminate freshwater resources, including drinking water. In addition, excess irrigation of lawns treated with pesticides creates toxic runoff that threatens fish and other aquatic life. All of this reckless watering is a threat to wildlife like the migratory birds and endangered and threatened sea turtles that rely on the island’s wetlands and coastal habitat. The Seattle region is known for its gray, rainy weather, which may be why its residents are in the habit of using more water than the average American. 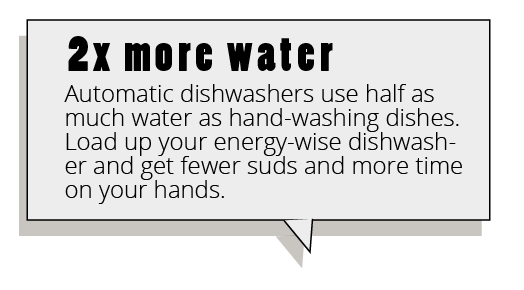 But lately the city is asking people to cut water use by 10 percent with familiar tips such as reducing shower time, turning off the tap, fixing leaks and curbing outdoor use by watering less and planting more efficient landscaping. This campaign may not have the same urgency as some of the measures targeted at water hog counties in California, but you might feel differently if you were a fish – according to the Washington Department of Fish and Wildlife, an usually hot, dry summer and higher-than-normal water use has led to fish being stranded across the state. Seattle’s water comes from the Cedar River and Tolt River watersheds, where overconsumption not only puts stress on the fish and other water dwellers, but also on the larger animals that rely on healthy fish populations for food. Suburban Orange County often tops lists of the wealthiest, safest areas in California, which unfortunately doesn’t translate to wealth and safety for the state’s water resources. The county’s water use had been steadily climbing prior to the drought and may be as high as 140 gallons per person, per day. It’s been reported that many residents are ignoring water restrictions and it’s no wonder with the mixed messages being sent by officials: Some cities aren’t bothering to fine people who violate the restrictions while others have said they don’t want people to cut back too much because they still want to sell water to residents. On the plus side, Orange County does have a strong water recycling program. However, the majority of its water comes from overtaxed sources shared by much of the rest of the region. More than 20 endangered species that rely on local groundwater, the Sacramento-San Joaquin Delta and the Colorado River, including migratory birds and native salmon, are competing against the large, lush lots around Orange County homes for a diminishing water supply. Austin’s per capita water use has declined from a 25-year peak of nearly 195 gallons per person, per day in 2000, but the city’s population has nearly doubled in that same time period. A burgeoning population, plus high water use and very hot temperatures has led to an ongoing water struggle between Austin Water Utility and the local residents it serves. The utility has been known to publish a list of top water users, which has featured members of Congress, venture capitalists and pro athletes, including Lance Armstrong, who was called out in 2011 for using 1.3 million gallons of water that year. The water supply in Austin is delivered from the Colorado River via a local system of reservoirs, lakes and springs. The county’s high water use not only affects biodiversity along the Colorado River, but also local wildlife including several rare salamander species. Los Angeles is trying to give itself a drought makeover with a “Drop Your Water Weight” campaign that urges residents to “kick-start your drought diet” by watering less and planting drought-tolerant plants. To help further motivate water dieters, some locals have turned to posting “drought shaming” videos online to make examples of local celebs like reality star Kylie Jenner, David Hasselhoff and Dr. Dre who have been hit with violations for overwatering their famous lawns. The county’s water comes from the Sacramento-San Joaquin Delta via the State Water Project, as well as the Colorado River Aqueduct and local groundwater. The species affected by L.A.’s water binges desperately need the county to stick with its drought diet – they may not have A-list name recognition, but many are on the Endangered Species List. After flooding spring rains, Dallas was declared drought-free – and immediately residents starting using more water, which led to an increase in water main breaks. Regular water main breaks not only waste water, but cost the city $90 million annually. Once high summer temperatures hit, it didn’t take long for drought to start creeping back into the city. 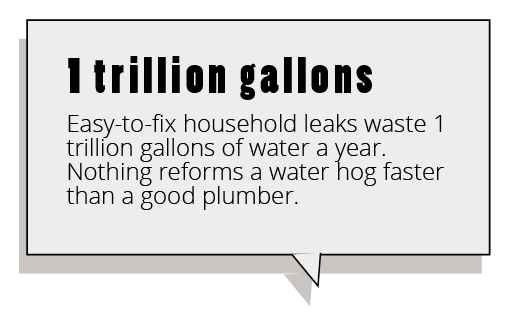 Dallas has some programs in place to help curb water waste, such as offering free high-efficiency toilets and minor plumbing repairs. However, the region’s water expansion plans to meet the demands of a rapidly growing population could spell a Texas-sized disaster for wildlife. A proposed dam would flood 30,000 acres of bottomland hardwood forest, as well as thousands of acres of grasslands, which is habitat for hundreds of species, including 27 threatened or endangered species. To add insult to injury, the project would also deprive wetlands – and the wildlife that depend on them – of water flow downstream. Hopefully the assistant director’s words will help the fact sink in that rising water bills come from draining water resources. Tarrant County gets its water from the Trinity River, and overuse threatens local wetland habitat for breeding and migrating waterfowl. According to a poll, 95 percent of San Diego residents consider it a civic duty to be efficient about their water use, but when the temperatures rise, their civic duty falls to the wayside to keep their lawns watered. Like many other affluent communities, parts of this county have seen fewer conservation efforts than other California communities, despite the local water authority’s attempts to foster neighborly competition with tools that compare water use among similar homes. The San Diego County Water Authority sums up the problem in its WaterSmart Lifestyle guide: “Life’s fun when it only rains 42 days a year, but that little bit of rain doesn’t produce enough water to supply the more than 3 million people who live here or sustain our growing economy.” And when millions of residents use an average of nearly a hundred gallons of water a day, it’s no fun for wildlife watching their water sources drained for the county’s sunny lifestyle. 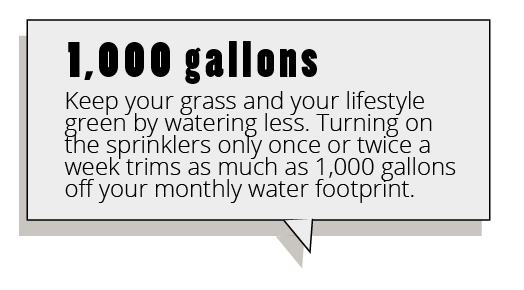 While it might seem that not as much water is needed on the east coast where the drought isn’t as bad as it is out west, water use in Suffolk County can jump to as much as 500 gallons per person per day during the summer, with most of that going to lawn care. 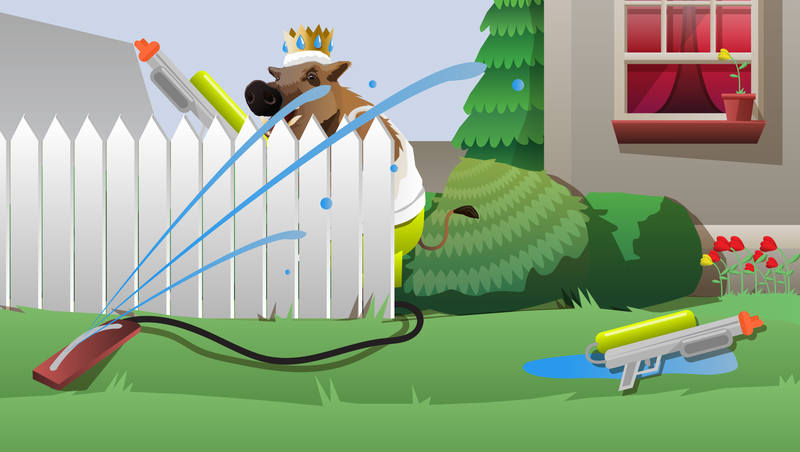 It’s easy to be careless with outdoor watering – many automatic sprinkler systems are incredibly inefficient, watering every day, rain or shine – and wasting at least as much water on pavement, grass tops and evaporation as what reaches the roots of plants. When Suffolk County overdraws its aquifers, salt water from Long Island’s surrounding waters can intrude on the water supply, contaminating drinking water and altering the ecosystem. Plus, overwatered landscaping tends to come with a toxic stew of pesticide runoff that threatens fish and other aquatic life. Residents may be able to afford this kind of lawn maintenance, but the price is high for the island’s unique coastal and wetland habitats needed by migratory birds and endangered and threatened sea turtles. From 1995 to 2010, the Orlando Utilities Commission saw a 26 percent increase in customers. While they’re working hard to keep overall water demand steady, Central Florida’s population growth is putting too much pressure on the Floridian aquifer, which may lead to increased pumping and pulling water from alternative sources like the St. Johns River. According to the Central Florida Water Initiative, the region is already pumping 800 million gallons of water a day from the aquifer – and pumping more than 850 daily gallons would threaten local springs, wetlands and rivers. At the rate the population growing, water needs could top 1 billion gallons a day within the next 20 years. That kind of growth could be a boon for a certain mouse who lives in the area, but it’s bad news for local wildlife. Since Contra Costa is further inland, it doesn’t benefit from the Bay Area’s fog, leading to higher temperatures and even higher water use. 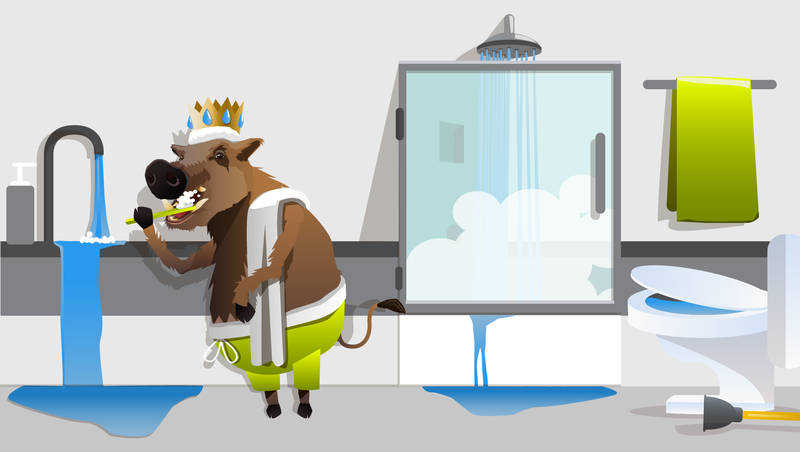 In 2015, some of the top water hogs of the county were exposed, including Oakland A’s executive vice president Billy Beane, who used 5,996 gallons of water a day during the summer. The county reflects a pattern throughout California, where more affluent neighborhoods with large lots and tree-lined streets use significantly more water than lower income communities. Similar to much of the state, Contra Costa County gets its water from the Sacramento-San Joaquin Delta, which is home to 20 endangered species and serves as a migration path for native salmon. In the past five years, Alameda County has added more than 100,000 residents, making it the fastest-growing county in California. As prices continue to rise in San Francisco, many people are fleeing to Oakland and the surrounding area, increasing the demand for water – not to mention real estate – in the county. Between the ongoing drought and lots of thirsty landscaping, this growing population is taxing one of the state’s major shared water sources: the Sacramento-San Joaquin Delta. The delta is used by migrating native salmon and is home to 20 endangered species including the Lange’s metalmark butterfly, California Ridgway’s rail and Salt Marsh harvest mouse. Wayne County has several wealthy communities with large lawns soaking up more than their fair share of the region’s freshwater. But a different water story has been unfolding in Detroit, where years of lax enforcement on bills led to thousands of water shutoffs, creating a human rights crisis as vulnerable populations lost their basic water supply. Meanwhile, commercial customers with unpaid bills continued to water landscaping and golf courses – it was reported that Ford Field, home of the Detroit Lions, owed more than $11,000 at one point and still had water flowing. In addition, the city’s struggling infrastructure – in particular broken pipes in abandoned buildings – leads to a lot of wasted water. Nature may not be what comes to mind when you think of Detroit, but this city and its suburbs are located in the heart of the Great Lakes region and are home to a network of wetlands, rivers, shallow shoals and wet meadows that provide diverse habitat for fish, frogs, turtles, snakes and other wildlife. The county’s water comes from local groundwater and the American and Sacramento rivers. The Sacramento-San Joaquin Delta alone is home to 20 endangered species, including Salt Marsh harvest mouse, Lange’s metalmark butterfly, California Ridgway’s Rail and several amphibians and fish, as well as serving as a vital migration path for native salmon. Palm Beach County boasts being the leading supplier of reclaimed water in Southeast Florida, reclaiming about one-third of all wastewater and treating it for reuse on lawns and golf courses. However, water reclamation alone can’t save the county’s water supply when per capita use remains nearly 50 percent higher than the state average and the population is growing faster than kudzu. Palm Beach County added more residents in the past year than the entire state of Alabama, Illinois, Michigan or Pennsylvania, which is more than the local aquifers can sustain. When underground aquifers like those that supply Palm Beach County are overdrawn, it can start to deplete wetlands, altering the unique habitat that many wildlife species depend upon. Southeast Florida’s wetlands support some of the country’s richest biodiversity and several endangered species, including wood storks, Everglades snail kites and whooping cranes. Amid the flashing casino lights and flashier entertainment, it’s easy to forget that Las Vegas sits in the middle of the desert, and that mirage of excess is built on a quickly dwindling water supply. Beyond The Strip and the golf courses are sweeping subdivisions with large land and water footprints. In the past 25 years or so, the city’s population has tripled, increasing demand for even more housing and infrastructure. Front lawns are now illegal in Vegas, but 70 percent of Lake Mead water, which provides the vast majority of the county’s water supply, still goes to landscaping. Not everything that happens in Vegas stays in Vegas. The city’s water consumption has far-reaching effects on wildlife throughout the region. About 90 percent of Vegas’ water comes from Lake Mead on the Colorado River, home to a range of endangered fish, birds and amphibians. When full, Lake Mead is the largest reservoir in the country, but today it’s at its lowest level since construction. Las Vegas’ search for new sources of water to feed its growing thirst is putting even more wildlife in the crosshairs, such as the Devils Hole pupfish, a highly endangered fish whose only known habitat on Earth has the misfortune to be located a mere 90 miles west of the City of Sin. Average daily per capita water use statistics are from the publication Estimated Use of Water in the United States in 2010, the U.S. Geological Survey’s most recent national report on water use. Some areas may have more recent published data, including some that have made strides in water conservation, but all of the featured water hog counties – the majority of which are in areas suffering from drought – continue to have higher household water use than the estimated average of 80 to 100 gallons per person per day. 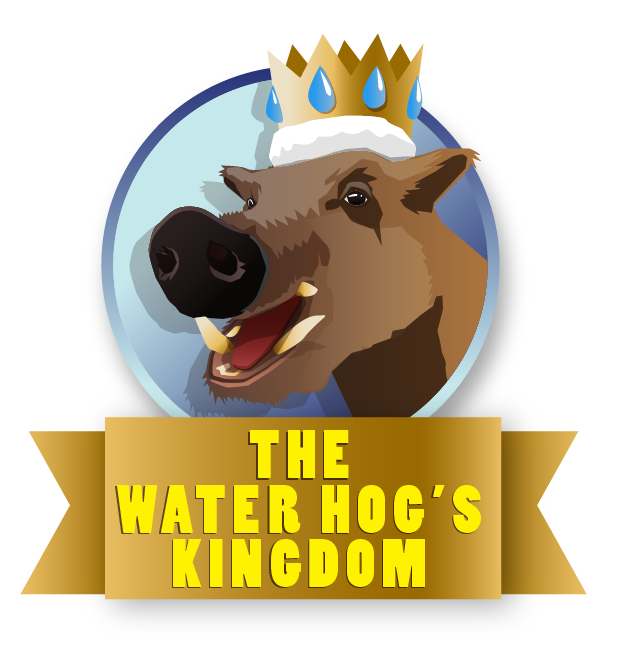 The mighty Colorado River shaped the landscape of the arid, wild west for humans and wildlife alike, but it’s no match for the Water Hog. 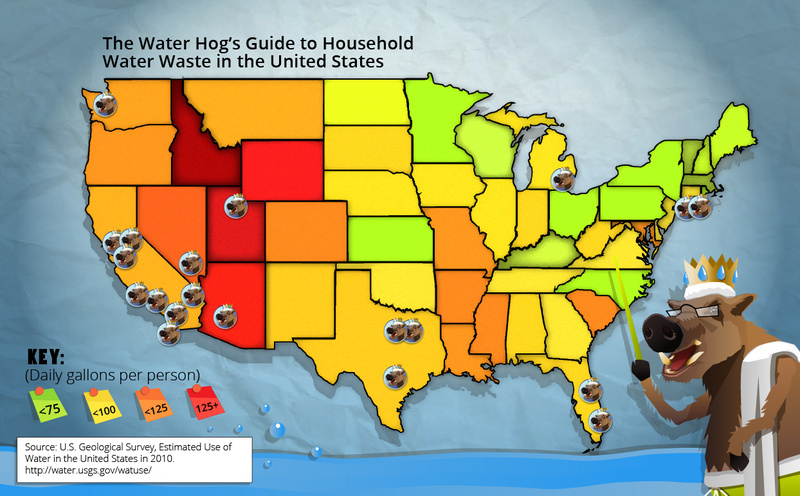 Six out of the top 10 Water Hog states (plus New Mexico) get water from the Colorado River. Today, the combination of a historic drought, booming population growth, complex and outdated water rights and high per capita water use has dropped the river’s flow to levels that are raising the alarms for water managers and wildlife conservationists, making this region the Water Hog’s Kingdom. 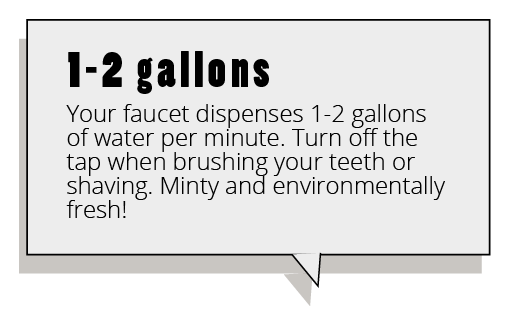 From brushing our teeth and flushing the toilet to watering the lawn and doing the dishes, the average American family uses more than 300 gallons of water every day. 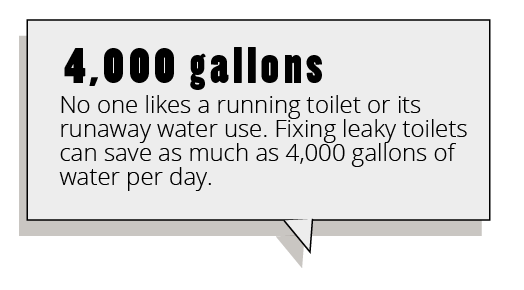 That’s the equivalent of 2,400 glasses of water down the drain. The water in our pipes is a finite resource that comes from rivers, streams and lakes where fish, birds, frogs, turtles, salamanders and other wildlife rely on it for their own survival. So don’t be a drip: Use less water to save some for their future and ours. 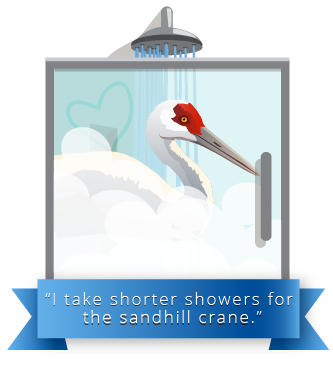 Share these badges to show off how you’re saving water to save wildlife. WaterSense toilets use less than a quarter of the amount of water per flush than older toilets, saving the average family nearly 13,000 gallons a year. 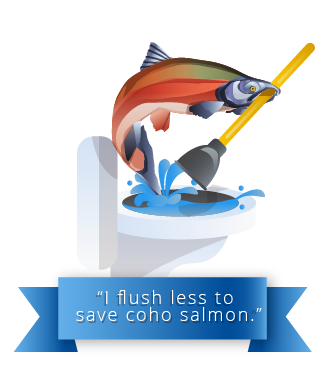 Don’t flush away the future of coho salmon that need healthy, robust rivers for their annual epic journey upstream to spawn. 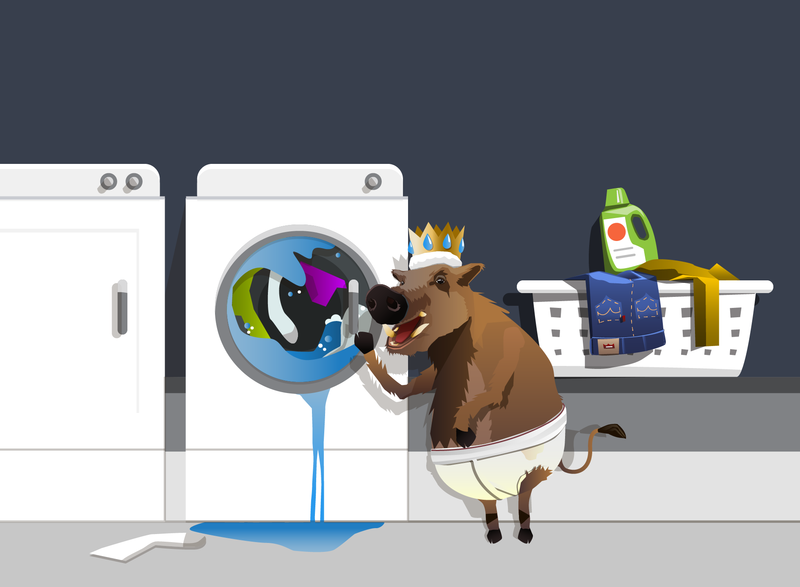 Laundry is responsible for as much as 40 percent of a household’s water use, which is particularly wasteful if you’re cleaning clothes that aren’t really dirty. 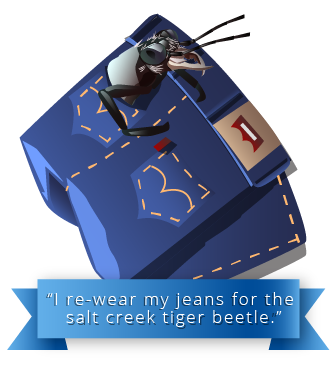 Re-wear your jeans 10 times to help save the dwindling habitat of endangered wetland species like the Salt Creek tiger beetle. 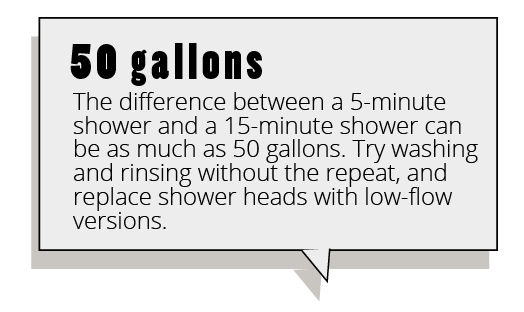 Every extra minute in the shower can cost up to 5 gallons, so standing under the spray for just 10 more minutes means 50 gallons down the drain. That’s a luxury sandhill cranes and other wildlife that rely on wetlands for breeding and nesting can’t afford. 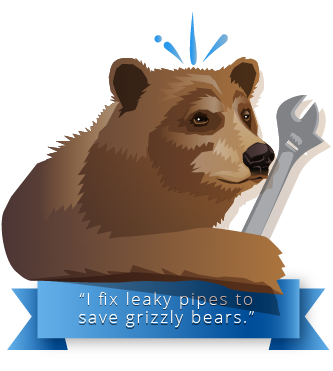 Fixing leaky pipes is one of the fastest ways to take a bite out of water waste. 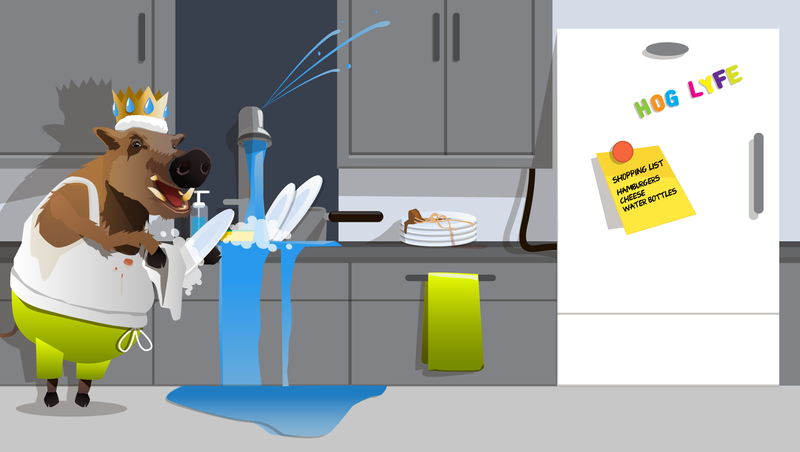 An average household’s leaks can drip away more than 10,000 gallons of water a year. That water comes from rivers where grizzly bears seek shelter and food. 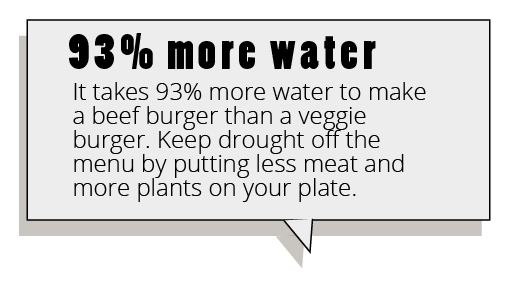 It takes about 100 times more water to produce a pound of beef than a pound of vegetable protein. 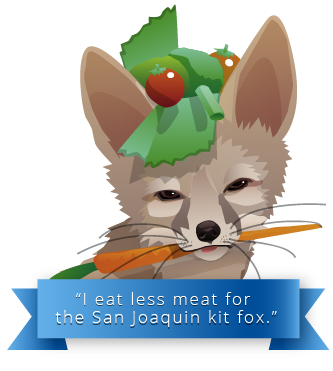 The average American diet is drowning in water waste, which threatens the survival of countless species, such as the San Joaquin kit fox that’s particularly sensitive to drought during its breeding cycles. As much as 50 percent of the water used outdoors is wasted from inefficient and unnecessary watering. 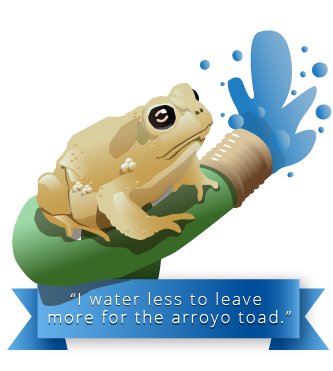 Choosing water-saving landscaping and watering less can keep more water in rivers and streams for arroyo toads and other amphibians that are an important part of healthy freshwater ecosystems. A project of the Center for Biological Diversity, supported by Levi Strauss & Co.